Hang On To Your Hosannas! So much has happened in the world over these days leading to Easter. Unrest in Yemen, the crash of the Germanwings airliner, Indiana passing legislation legalizing discrimination under the banner of religious freedom, and even one Senator who wants to make it mandatory to go to church! The headlines that bookend the world we live in are one reason I titled this message “Hang on to your Hosannas”…because in short, we’re going to need them. 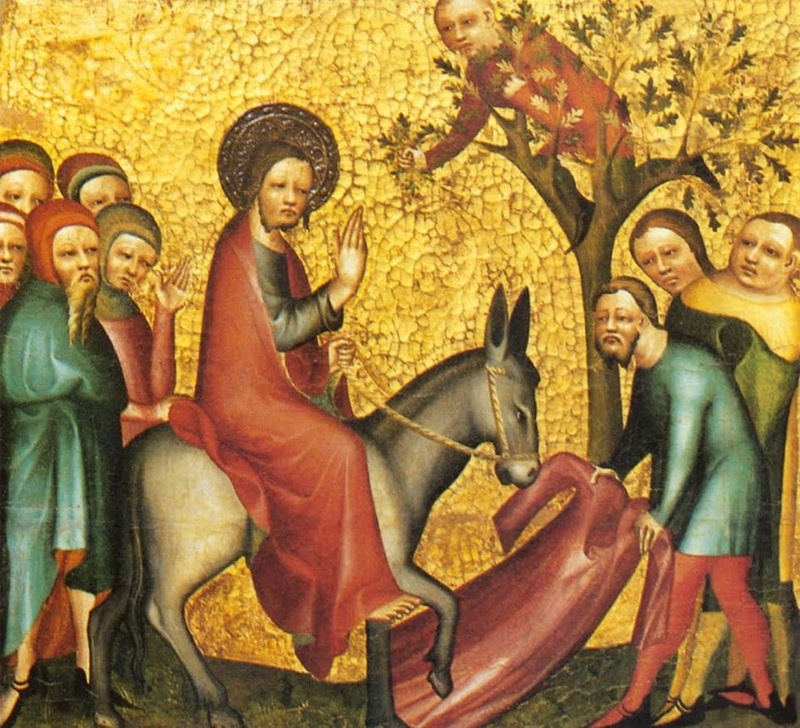 Every year I ask myself, “ What is different in the world this Palm Sunday? What insights from Jesus’ entry scene and final days can give us clues to God’s greater hopes for the world And how can OUR entry into holy week affect our own Easter hope? One of the “noticings” about holy week is that it teaches us a fundamental truth. We cannot (and should not) skip ahead from celebratory palm branches to Easter miracles, without first going through the events and sorrow that brought it about. Anyone that has ever gone through great pain knows that the only way to get through it is to go through it. Was it the same with Jesus? He knew what was coming and that these were his final days. The first century world was just as frightening for our spiritual ancestors as our modern world is for us. The people desperately wanted to be delivered. And so on this day we’ve come to know as Palm Sunday, the streets of Jerusalem were packed with visitors who came for Passover, many of whom either already were disciples of this man Jesus, or who were curious, just wanting to catch a glimpse of him. It’s curious then that Jesus comes to the city not in a powerful way, but in a ludicrously humble way—a grown man riding a donkey colt. The contrast of the military garrison that rode in from the opposite direction must have been quite a sight. They was there to incite fear and demonstrate military power, while Jesus’ entry was about hope, God’s power, and the possibility of redemption. Matthew’s gospel is careful to show Jesus fulfilling the prophecies of the Hebrew prophet, riding animals described in Zechariah 9:9. The crowd hails him with a formula taken from the Psalms—all an intentional calculus to underscore his divinity and his purpose. And despite this anti-powerful entry, the cheering crowds clear his way and hail his presence! And they yelled Hosanna! Hosanna in the highest! You and I understand the word Hosanna to be a shout of praise. But it wasn’t always. In Hebrew the word is hôsî-âh-nā and it means “Oh save us!—Save us now!” Redeem us from the oppression of Rome. Save us from a political climate that is killing us. Do you ever wish there was a modern Messiah in that could save us from the crazy and the tragic happenings in our world? We may not be lining the streets physically shouting Hosanna, but I’ve been tempted to shout Hosanna at my television set! And then, sitting on that beach in California, I had a thought. Jesus came that we might live and he left that we might carry on that work in his name. This annual review of his final days serve to remind us that WE ARE THE BODY OF CHRIST NOW. Did you notice that our reading included verses 12-17, where Jesus upends commerce in the temple, turning over the tables of the moneychangers. In a single moment of righteous activism, Jesus sweeps the temple mount clean of those whose financial interests impeded access for all to the temple. And while there, he takes time to heal the sick people who are brought to him, and he hears the praise of children. All of which precede his indictment as a subversive influence that must pay the price of any political dissident—crucifixion. That one day, that one week is a micro-view of his whole ministry and by extension OUR ministry—healing, praise, witness and upset! Hosanna indeed! That is Palm Sunday, this holiest of days when we enter a week of witness; a witness of ultimate pain born of ultimate love! To witness Jesus and the glory of God on one side, and Rome’s soldiers in all their frightening finery on the other. Deliverance or judgement? Way of Jesus or way of empire? Who and what will you and I clear the way for? What Easter hope does God hold for the world? The church of today is only irrelevant if we let it be. Hang on to your hosannas because the world looks to each of us to complete, in his name, what Jesus began. Let me be perfectly honest here. There isn’t a preacher taking on this assigned text today who can tell you (with certainty) what this story means, so let’s just admit it– this is an ugly parable. The good thing about this and other parables is that they invite us to think. In fact the beauty of so many parables is that they raise (and often do not answer) life’s big questions. So why is it that the churches of yesteryear tried to serve up easy answers? The church of my greatest imagination would teach less about what to think/believe and more about HOW to think/believe. It’s the questions that draw us into encounter with God and isn’t that the point? Compared to Luke’s’ more gentle account of the same banquet, Matthew’s version is darker, more violent, and pushes absurdity to the edge. It seems the disciples were remembering the story very differently. Why is that? It’s helpful to know is that Matthew and his community were caught up in a struggle with their Israelite brothers and sisters about how to be faithful to the God of Abraham and Sarah and, in particular, whether Jesus of Nazareth was the Messiah Israel’s prophets had promised. The divide was very charged, which may be why Matthew is at his wits end trying to illustrate the grandness of “the invitation,” casting characters who are indifferent and even hostile. And here’s the thing we cannot sanitize. Though this is not a Jewish-Christian dispute, Christians have used this parable to drive a wedge between Jews and Christians. Shame on anyone who does this. That said, if I were to offer a takeaway message from this violent story, it would be that it imagines the divine utopia of bringing all of God’s children together under one roof, once and for all, not despite our differences but because of them! 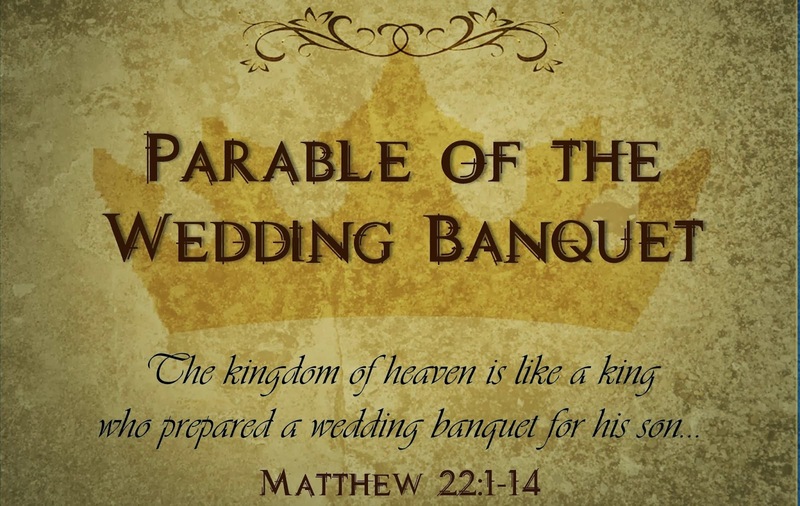 The kingdom of God would be like that kind of place and that kind of celebratory banquet! But then the parable jolts us by introducing the man who shows up not wearing the right clothes. And of course the punishment for a breach of dress code is outer darkness, right? Of course NOT. That is the absurdity of the metaphor. What if this man’s fashion faux pas has nothing to do with clothing but rather that he either didn’t understand the magnitude and honor of the invitation? He had just been given a golden ticket and he didn’t get it. Do we? He was offered an invitation to transformation and is cast as dishonoring the invitation and the opportunity. Even setting the eternal aspects of the metaphor aside, the parable also seems to get at something very human and current. How many of us are part of families with so radically different political and religious world views that it might as well be an afterlife kingdom that could get us on the same page? The simple practice of gathering over a holiday meal feels as though it requires a moderator, like the kind that works political debates. Truth be told, if left to our own devices it’s easier to hang out only with people that look like and think like we do. Truth be told it’s even easier to get stuck in our own revelation, refusing to be transformed by the possibility that there may be an invitation we’ve ignored. We live in a world where identity divides us into red versus blue states in this country, where Muslims and Jews are in conflict in Israel and Palestine—a world where ISIS has gone rogue on the peaceful teachings of Islam. It’s overwhelming to live with such strident division. So as long as we are wondering together, could this Kingdom simile be imagining an invitation to a beloved community beyond even our own imagination? The hope of such a kingdom is reason enough for Matthew to become overzealous to the point of ridiculous. Why should we love the stranger? Because God does! Jesus’ teaching was never limited to people who look, act, or think like him. Alleluia. In the end what we most have in common is our humanity, not our religion, amen? In the end, whether with our families, our community, or the world got made and loves, how hard is it really to see God in each other? Looking back at our metaphorical King and Matthew’s attempt at capturing such a grand hope, I think I can understand why the story goes to such an extreme. So it wakes us up! The invitation was and continues to be the most extravagant invitation in the history of the world. No wonder the King didn’t want the banquet to begin until everyone was invited and present. Everyone. No asterisks. No exceptions. I call that a banquet of possibility– one where we are all invited to take off our garments of suspicion and self-interest, exchanging them for the garments of grace and transformation. Ugly parable? Maybe. Good News? Definitely. May it be so. Note: this message is heavily influenced by the writings of David Lose, Barbara Bradford Taylor and the text musings of the workingpreacher.com group from Luther Seminary.